Brush longer they will. The Oral-B Pro-Health battery toothbrush for kids featuring Disney Star Wars characters is the perfect toothbrush for your little Jedi Masters. While their smiles continue to grow and develop there’s no better time to start healthy oral care habits. 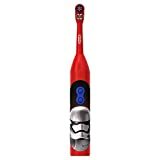 The Oral-B Pro-Health battery toothbrush for kids featuring Disney Star Wars characters is an advanced children’s toothbrush with the added benefits of battery power to help them get the most out of their brushing routine. Best of all it is compatible with the interactive Disney Magic Timer App by Oral-B to help kids brush for a dentist-recommended 2 minutes.